"State politicians go to great lengths to achieve these results. They spent somewhere between $2.6 million and $2.9 million of our money on consultants, personnel and legal expenses for the 2000 redistricting. And sometimes they had to draw weirdly shaped districts to enhance the job security of incumbents. The 64th Assembly district (pictured at right - click on image to enlarge) in the Kenosha area was named one of the 10 ugliest districts in America in a state-by-state analysis released this April by the Rose Institute." The thing is, the current districts, like the 64th cited there were drawn by FEDERAL JUDGES, not legislators. That district wasn't drawn as a partisan gerrrymander, it was drawn by a court. Judges! 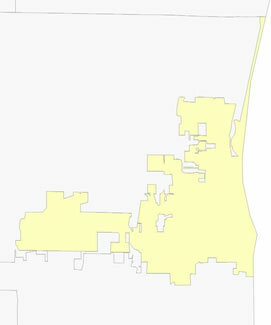 And the ugly shape of the district has as much to do with how the municipal boundaries are due to annexations. The fact is that the city of Kenosha has an ugly boundary and that district is almost entirely drawn around the city boundary. Again, not the fault of legislators. This commment is itself inaccurate and misleading. When control of the legislature is divided and the partisans in the two houses split on a final plan and then take their dispute to federal court, the judges are put into the position of mediating and eventually settling the dispute. It's not like they are starting from scratch and designing districts out of whole cloth. They are responding to the plans put before them by the litigants, namely the legislators. Anyone who followed the last redistricting knows that Jensen and Chvala cut a number of deals aimed at making the Senate more likely to stay in Democratic hands and the Assembly more likely to stay under GOP control. They couldn't agree on everything, though. So they took it to federal court and tried to convince the judges to side with them. The judges didn't stray far from what Chvala and Jensen brought to them. As for the Kenosha district, since when have legislators been consistent in respecting municipal boundaries when drawing districts? They do when it suits their purposes. They don't when there is a political reason not to. Good points, Dean. It's also an open secret that even though the constitution makes legislative and congressional redistricting the legislature's responsibility, the congressional maps were drawn by Dave Obey and Jim Sensenbrenner. Anon's comment begs the question, so it's just one big coincidence that there have only been two competitive U.S. House races this past decade and only a handful of competitive legislative elections every two years? It all can be explained by ugly municipal boundaries due to annexations? Come on, Ole. Lena wouldn't even buy that. 1st anonymous commenter, what did the legislators spend almost 3 million dollars of our money on if the judges did all the work?